On my last post, Sept 19, I talked about my experience with GenForum, a message board provided by genealogy.com. But until this week, I didn’t know that there was a difference between a message board and a mailing list. And as happens often in genealogy, you learn something new when you have a question that you need answered and you ask for help. That’s where Kate Herron, my friend/mentor from Chicago, IL, and the mailing list come in. 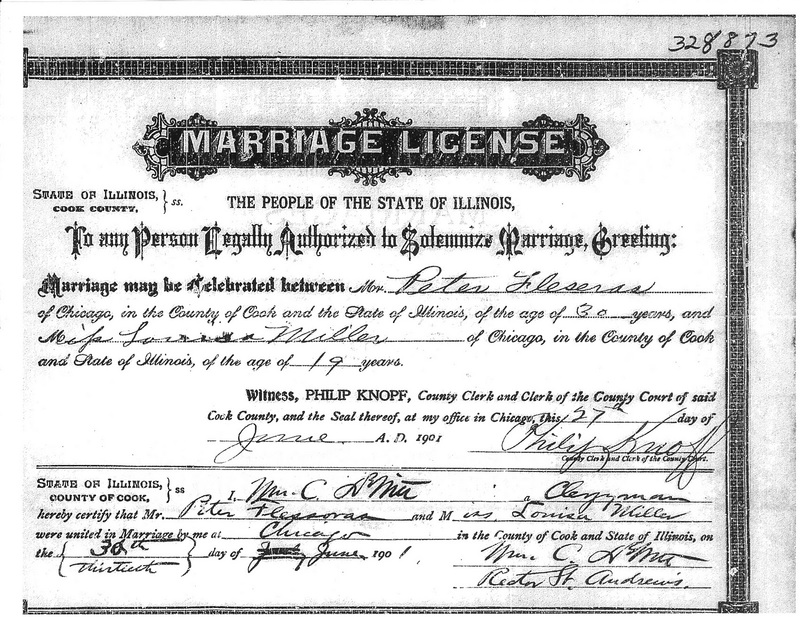 The question that I needed answered came from a marriage license for my maternal great grandparents, Peter Fleseras and Louise Miller. I found the document at FamilySearch.org. 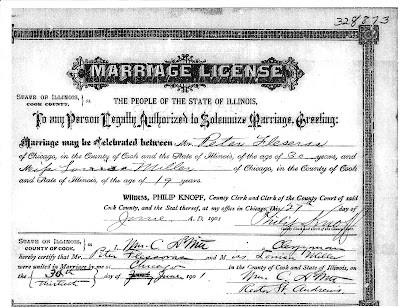 The document says the marriage was performed by the rector of St. Andrews in Chicago, IL in 1901. But I couldn’t read the name of the rector. Hard- to-read handwriting is one of the things that plague genealogists. I know that Peter Fleseras was Greek and that Louis Miller’s father (Frederick Miller) was German and her mother (Catherine Norton) was Irish, from County Mayo. Which church would they probably have attended? Greek Orthodox? Catholic? Protestant? I googled for St. Andrew in Chicago, IL and found both a Greek Orthodox and a Catholic.The Greek Orthodox St.Andrew opened in 1926 – after the 1901 marriage. The Catholic St. Andrew opened in 1895 – well in time for the 1901 event. I tried some analysis on my own. Catholics don’t usually write “clergyman” on a document. They put “priest”. And “rector” didn’t seem to be the usual Catholic choice of words either. Well, this gave me plenty of challenges. I didn’t know that rootsweb.com had a mailing list function although I had been using their WorldConnect section for years (see future post). Second, I didn’t know what “digest mode” meant. And third, I didn’t know how to “link” inside a mailing list post. Here’s where I can offer a piece of advice: never abuse your community of friends and mentors by asking pesky questions that you can find the answers for yourself. Save them for the BIG questions. So I started educating myself about message boards and mailing lists. I went to the wikipedia site on internet forums to find out exactly what these two forms of communication are and how they differ. To paraphrase wikipedia, a message board, or web forum, is an internet discussion site where people have conversations that take the form of back and forth message postings. A mailing list (in the link scroll down to "Comparison with other Web applications") is also an internet discussion site with posted messages. It differs from a message board mainly in how messages are retrieved. On a mailing list, new messages come directly to your e-mail inbox; whereas on a message board, you have to log-on to the site to see messages. Some message boards, like GenForum, will send you an e-mail notification that there are messages waiting for you at the forum site. My next self-education step was to find out what was “digest mode”. I returned to rootsweb.com and went to the Help section.The difference this time comes in the way you receive messages from the list. In “mail mode”, you receive each single message at the time it is sent to the list. That could be a lot of messages in your inbox. In “digest mode” you receive a group of messages once a day or so. This latter way cuts way down on traffic to your inbox. Armed with this information, I was ready to go. I subscribed to Cook-CO-IL-L by following the instructions at that site. I received a message response from the administrator of the list that included an address of the list that I should send my messages to. I posted my message on Cook-CO-IL-L on Tuesday, Sept 20, 2011 and in two days received several answers. I hit the jackpot with the message suggesting that I check out the 1900 Lakeside Chicago City Directory at ChicagoAncestor.org. St. Andrew’s Church – Washington boul(evard) Cor(ner) S. Robey. Rector, Rev. W.C. DeWitt. This was it! As I looked back at the nearly indecipherable signature of the clergyman on the license, everything just fell into place. You can be sure that I will make more use of the mailing list feature of rootsweb.com in the future. And by the way, rootsweb.com also has a message board feature.